Wow. Hard to believe we are done with our costal walk. We started at Falmouth and ended last night at Plymouth. To be truthful, we didn’t walk the entire 80 miles…after the first two days of 14 & 16 miles, and arriving at our destinations so tired that we couldn’t walk around, we decided to walk a little over half the course each day and then take a bus. Of course, there was the day with the gale force winds..we opted out of that afternoon because 60 mph winds while cliff walking is a tad scary!! The walking is amazing and the towns were spectacular. I love the English countryside. Love. 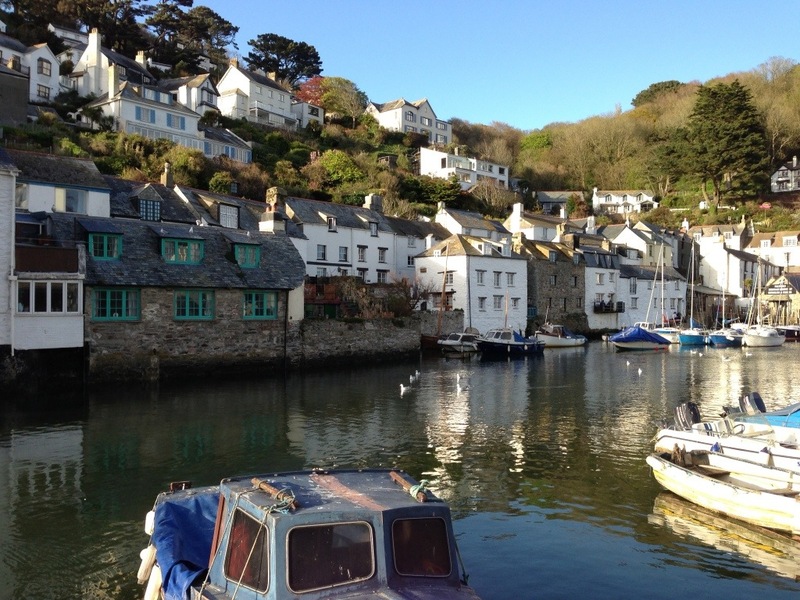 This is one of my favorite stops.. Polperro. We had a house right on the bridge at the end of the quay, where the river flows underneath. So lovely. And, I discovered a knitting book with Cornish stitch patterns that I will talk about in my next post. But now for the wool story. I’m not gonna lie..I was so excited to see fields and fields of sheep when we were on the train from London to Falmouth. At that stage, I think I saw more sheep than people. 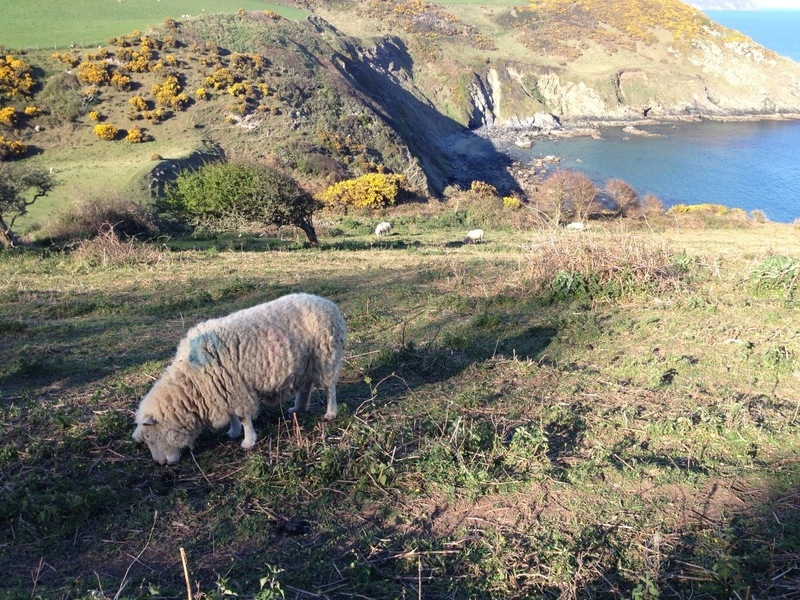 However, I didn’t really think we would see them on the hike…too close to the cliffs and all, right? Wrong. On the very first day, we went through a gate that said “stock grazing,” and I figured it would be cows. 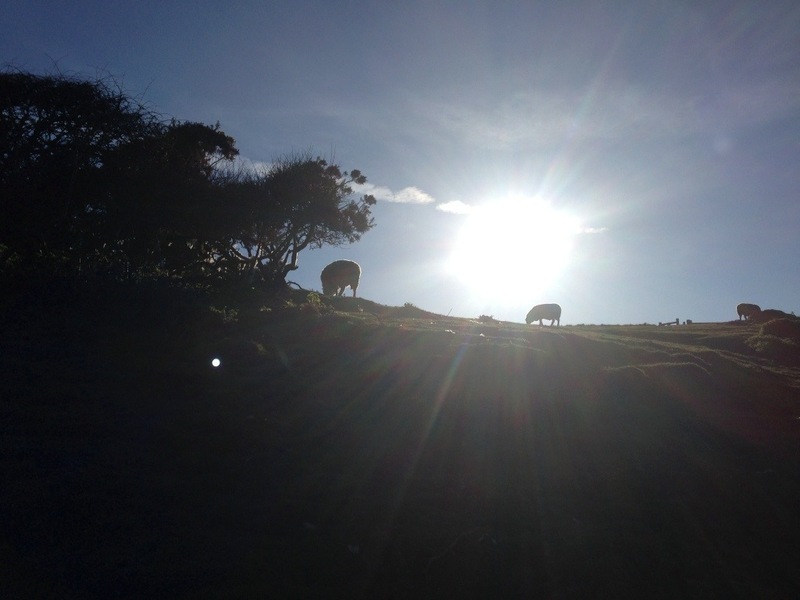 I looked over the hilltop and thought I saw something moving, so I called out “sheep!” to my hubs. Right when I said that three heads popped up like ET and stared at us…from that point over we were walking through fields of sheep, which was glorious. And then the crazy coolness started. It’s great to look at them and appreciate the beautiful coats, etc…but really, I wanted wool to spin. Not like that’s going to happen, right? Well, apparently there’s been some sheering in this area recently, and when we rounded the corner, chunks of wool were floating around. Real chunks, clean with locks, etc. It was crazy!! I wasn’t going to gather any at first, but then thought that even if I get a little, it’s a cool souvenir, right? Wool from Cornwall? Yeah! Yep. I wool gathered along the coastal cliffs of Cornwall. Awesome!! And now we are off to Portsmouth to see friends and then finishing next week in London! Best. Vacation. Ever. 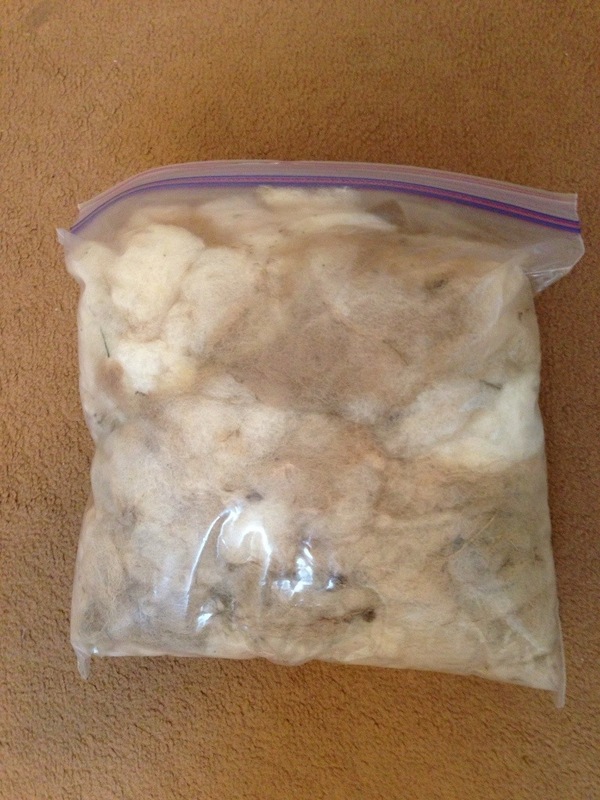 This entry was posted in Fleece Processing, knitting, Real life?, Spinning and tagged fleece, hiking, knitting, Spinning, traveling by Leah. Bookmark the permalink. Thank you! It’s been absolutely amazing so far!! I can’t wait for some more exploring! Now I don’t want to gloat, because that wouldn’t be nice, but welcome to my world. Or at least my county. Glorious isn’t it? I’m further west than Falmouth, almost at Land’s End, but in my humble and utterly unbiased opinion, Cornwall is even better further west. It is incredible!! And yes, I am slightly envious! The countryside is breathtaking…even on the rainy days! Ha! Don’t let it go by without harvesting! I do think they would give me a hard time..dirt and germs, etc. If it were processed and clean, different story!